Walter Emerton was born 1891 at Belton, where his father, also Walter, was head gardener at Belton House. They lived in the Gardener’s Cottage, next to the Lodge. Walter (senior) was born in Bedfordshire (1860) and served his first apprenticeship at Mickleover Hall, Derby. He moved on to Allestree Hall, then Larkhill Gardens, Liverpool and Moat Park, Maidstone. He also worked for Vight & Son to gain experience of fruit growing. Before coming to Belton he was foreman at Ashridge Park, Hertfordshire, where he met Sarah Tompkins, a local girl (born Berkhampstead 1868) who he married in 1890. 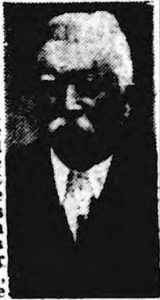 Soon after their marriage Walter and Sarah moved to Belton where they had 3 children: Walter, Emily Eleanor (1894) and Doris Henrietta (1896). Walter senior retired c1939, having worked at Belton House for nearly 50 years. He died in Jan 1942, aged 82. Doris married Frank Cashmore in 1926; she died in Staffordshire in 1981. Emily didn’t marry; she died in Harrow in 1966. After 6 years at Grantham Kings School, Walter (junior) became a butcher (as was Sarah’s father). He worked at Great Malvern (Cross Farm, Upper Howsell), Melton Mowbray and then Upminster, Essex. In Oct 1914 he enlisted in the Royal Garrison Artillery. 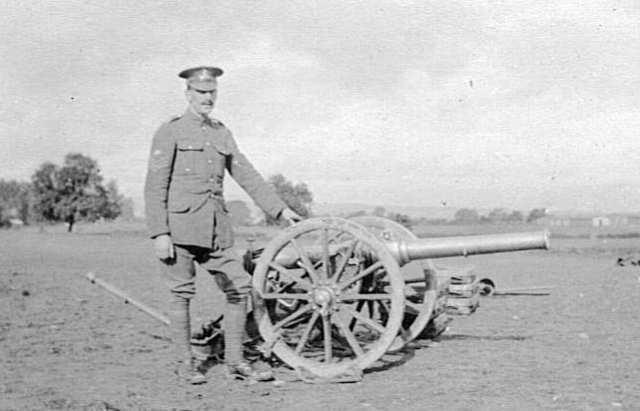 After training at Great Malvern he joined the Argyll Mountain Battery, 4th (Highland) Mountain Brigade, a territorial unit equipped with 10 pounder breach-loading canons (also known as screw guns). Unlike the conventional artillery, which used horses and limbers to move cannons along roads, the mountain gunners could break their guns down into smaller components, which were carried on the pack saddles of their highland ponies. This enabled them to operate in difficult terrain where conventional artillery couldn’t go. RGA gunners were required to be bigger and stronger than other artillerymen. In 1915 the Allies decided to seize the Dardanelle Straits and force the capitulation of Constantinople, removing Turkey from the War. After the Navy failed to force the straits, an expeditionary force was sent to seize the Gallipoli peninsula. 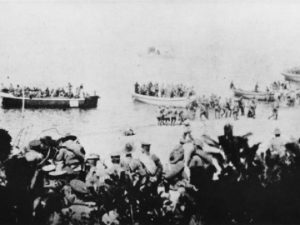 The landing on the southern tip of the peninsula was led by 29th Division. The 4th Highland Mountain Brigade was the only territorial unit attached to the divisional artillery. On the morning of the 25th April 1915 the Argyll and Ross Batteries embarked on HMS Euryalus. 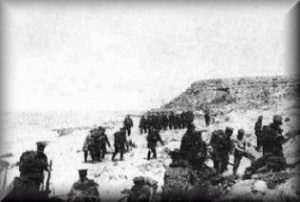 One two-gun section from each battery prepared to follow 1st Battalion Lancashire Fusiliers onto W Beach on the south edge of Cape Helles. The plan called for them to land around 8:00am, but obstacles on the beach were covered by ferocious machine gun fire and many of the Lancashires were hit before they even hit the land. Their heroic actions in securing the beachhead earned them 6 Victoria Crosses. The highly mobile, light mountain guns were the first artillery to land. The situation on the beach was so desperate that, whilst the gunners went straight into action, others from the batteries used their ponies to haul small arms ammunition and water to the infantry, who were desperately struggling to hold their precarious positions. As the division pushed up the cliffs the mountain guns were the only weapons able to effectively and quickly suppress enemy machine gun nests. This required the gunners to move their guns by manpower alone up onto precipitous cliffs and into the front line trenches, right alongside the infantry. The little mountain guns were in constant demand. The Argyll and the Ross batteries were rushed back and forth across the front and were in action every day until August, when they were withdrawn to prepare for the landings at Suvla Bay. The gunners had little time for rest or repairs. Each time the Turks realised the gunners were present they called in their own heavy artillery to silence them. Unlike their replacements, the old mountain guns had no shields to protect the crews. By June so many men had been killed, wounded or succumbed to disease, that the 2 batteries were combined as The Highland Mountain Battery. The guns became so worn out they were unrepairable. Gunner Emerton had been in the fight since landing on 25th April. On the evening of 18th July he was returning to the battery from a forward gun position in the trenches when he was shot through the left lung by a Turkish sniper. He was taken to a dressing station where he was visited by a friend, Gnr Fraser, but he died early the next morning (19th) age 23 and was buried at Twelve Tree Copse Cemetery. His battery commander, Lt T Duncan Wallis and another friend, S Sandford, both wrote to his parents. His name is on the Belton War Memorial.